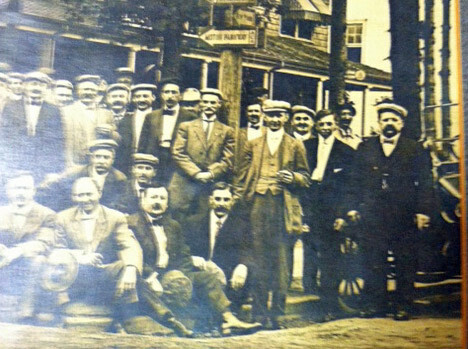 Kathy Curran, Executive Director of the Suffolk County Historical Society, submitted this previously unpublished photo of a car club dated June 20, 1911. Kathy notes: "This photo was given to a village historical society by a donor whose grandfather was a member of the car club. When I saw the Motor Parkway sign, I thought of you." 1. Name the car club posing in this photo under the Motor Parkway sign: Sayville Automobile Club. 2. 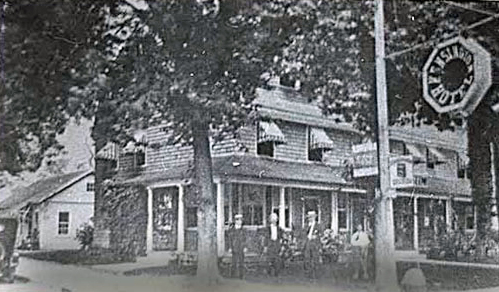 Location where the photo taken: Kensington Hotel located on the northeast corner of Main Street and Railroad Avenue in Sayville. Congratulations to my favorite co-author Al Velocci and Mystery Foto expert detectives Greg Oreiro and Steve Lucas for solving this very difficult challenge. Mystery Foto #33 Update: Jerry Helck, former owner of Old 16, has provided another possible location for the Mystery Foto. If you wish to submit a Mystery Foto, please send a jpeg to Howard@Kroplick.com . Bonus question: Identify the top sign. It is likely a pennant indicated the location for a local yacht club. My favorite co-author believes he has solved the mystery. Here are three more views of the location. Don’t laugh,another one of my wild guesses,is it Krugs Corner?I i’m desperate aren’t I? I’ll try anything,won’t I? Thanks to Al for cracking it wide open for me! My best guess on the car club would be a chapter of the American Automobile Association (“AAA”/“Triple-A”) since I believe they were the most prominent club at the time. 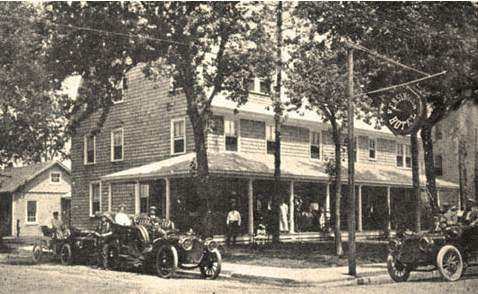 The club is standing in front of the Kensington Hotel on the Northeast corner of Main St (Montauk Hwy) & Railroad Ave. Prior to it being the Kensington (1900-1952) the hotel was known as Bedell Tavern (1837-1899). Railroad Ave changes names a few times, but following it takes you directly to the LIMP almost on the Petit Trianons’ front steps, so that Motor Pkwy sign would be accurate. I couldn’t concretely match the sign for the bonus question to anything, but it would appear to be a nautical flag/yacht club burgee maybe indicating a marina, club or ferry service nearby. I believe the location of the photo is on the northeast corner of Montauk Highway (Main St.) and Railroad Avenue in Sayville, NY with the Kensington Hotel in the background. The sign to the left of the Motor Parkway sign looks like a yacht club pennant so I’ll take a wild guess and say Sayville Yacht Club. And maybe the club is the Sayville Automobile Club. It also occurs to me :how do we know the group is a car club and if so what might the name and background of that club be? Howard - guess I was too late - my entry was going to be Sayville also based on Al’s photo of the Kensington Hotel. But I spent too much time trying to find the yacht club flag shown in the picture. 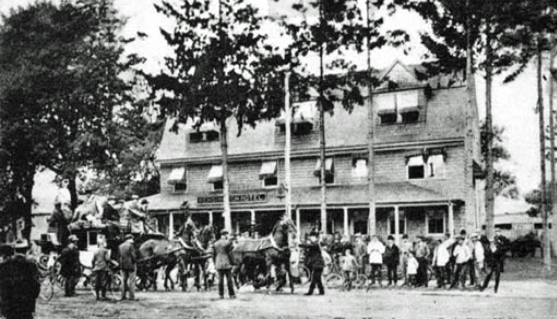 I e-mailed you a NY Times article from Sept. 1905 showing the hotel and others and 4 routes of interest to motorists on LI - #4 being the Vanderbilt Cup Race route.